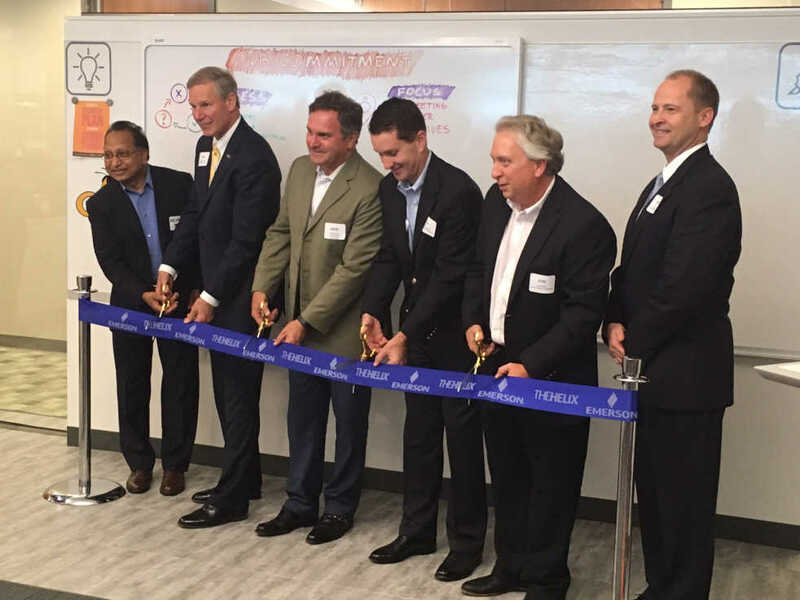 Emerson Electric Company opened a new collaboration space in Tech Square to explore Internet-of-Things and Big Data driven solutions to environmental issues stemming from the design and manufacture of electronic devices and machinery, with a particular focus on the Heating Ventilation Air Conditioning and Refrigeration (HVACR) industry. Emerson is a global manufacturing company based in St. Louis that employs over 110,000 people around the world, does business in 150 countries and operates 205 manufacturing plants worldwide, including 65 in the U.S. They were ranked number 120 on Fortune Magazine’s 2015 Fortune 500 list of largest US corporations by revenue. Emerson is also a large manufacturer of home appliances, including refrigerators and climate control systems. The Helix Innovation Center at Georgia Tech is their fourth such center, the others being the Helix Innovation Center at University of Dayton, Ohio, the Europe Solution Center in Aachen, Germany, and the Emerson Innovation Center in Pune, India. This space is their first foray into collaboration with data analytics specialists, and their first fully-fledged investment in the Tech Square area, though their representatives, engineers and recruiters have already been forming relationships with students, faculty and staff in the Tech community for over a year. “We want to create the right environment and culture for innovation to address industry challenges and better serve our customers,” Dunson said during the meeting. Emerson’s first foray into campus collaboration at Dayton was a $35 million facility featuring a full-scale 2,000 foot residential home, commercial kitchen, light industry, supermarket and refrigeration unit inside it, so that extreme conditions and other different scenarios can be tested and improved upon. The Center at Tech has 1,600 square feet of space equipped with state of the art communications technology for in-person and remote collaboration. This is intended to allow the employees and experts at the Center to work on projects or problems affecting their facilities anywhere in the world in real time. Emerson joins over a dozen other major corporations to invest in Tech Square collaboration space in recent years. They will employ 12 people at the Center, approximately six of which be employees rotating through from other Emerson locations. Their closest major facility in Kennesaw, GA employs over 200 associates specializing in refrigeration solutions for vehicles, retail spaces and industry. The HVCAR industry spans multiple industrial sectors and even expands into the home through household central heating, air conditioning and refrigeration systems. HVCAR systems are also used in data centers, supermarkets, food transportation services and most light commercial buildings. Currently, HVACR is one of the most energy-intensive industries in the world and has long been a primary focus of energy reduction efforts in the home. Multiple technologies have been created to improve the efficiency of thermostats, including Nest’s smart thermostat. Nest and similar projects claim to significantly reduce energy usage through self-scheduled adjustments to the temperature based on users’ preferences, time spent in the house, and multiple learning processes which determine the best times to switch off the HVAC system without causing discomfort to users.